A book is enough to make a reader pleased but the environment around it has the magic to win his heart. 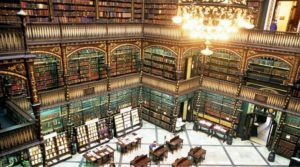 The photos and the details of these libraries were sufficient to make you awestruck so just imagine what it would be like to sit there and read a book that is dear to you. 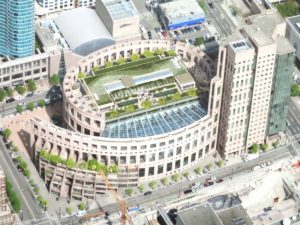 The Central Library of Vancouver is the third largest library of Canada. With facilities like free wifi, photocopying machine, wheelchair accessibility is available as well as escalator for every floor there. It has about 2.6 million books available for access. This library also provides programs for children and adults. The doors of this library fascinated in the creation of a Portuguese library opened in 1837 by a group of Portuguese immigrants, merchants in Rio de Janeiro.The style of the building was neo-Manueline to represent the Portuguese overseas developments.The bookshelves of this library rest upon the iron col- onnades decorated with neo-Gothic motifs. The library’s collection is around 6,000 and the collection is rising towards 400,000 volumes. 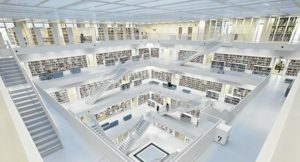 The library of Stuttgart city is constructed out of pale grey fair-faced concrete that visually frames an range of 9 x 9 snowy glass bricks also popular as the eye catcher. The nine-storey library building rises up like a crystalline cube within the lawn area at Mailänder Platz. Located on the Enns River in the town of Admont, Austria, the library of the Benedictine Monastery is oldest remaining and the largest monastic library in the world. This library is divided into three sections and has about seven frescoes on the ceilings. It also has four sculptures- The Four Last Things, a group of four oversized presentations of Death, the Last Judgement, Heaven and Hell. 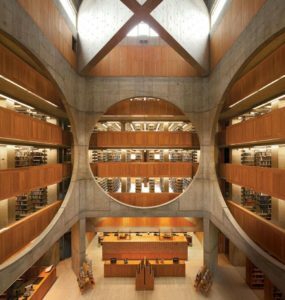 The collection of this library ranges from 200,000 volumes. Abbey library is popularly known to be one of the richest medieval libraries in the world till date. It wasn’t long before the library became well known for its collection of illuminated document, science and western culture. In the 18th century, the library was moved to a new place which was designed in a decorative rococo style. This library also has about twelve centuries of collections. Phillips Exeter Academy Library was originally division of the Phillips Exeter Academy, an independent boarding school. The outer ring includes all four external walls and the library carrel spaces immediately inside them. The middle ring has the heavy book stacks. The inner ring has several floors of book stacks. This library has also won the 25-year award for its wonderful architecture. 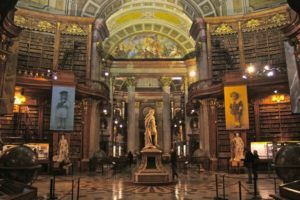 The library was originally called the Imperial Library founded by the Habsburgs. 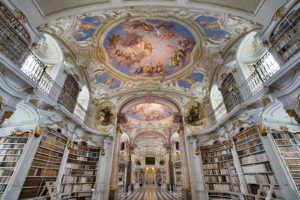 The ceilings of the Austrian National Library has frescos made by the artist Daniel Gran which makes it one of the most beautiful libraries of that Will Make You Awestruck. It has over 7.4 million books to read with the collection ranging back to the 14th century. The complex includes four museums, as well as multiple special collections and archives. 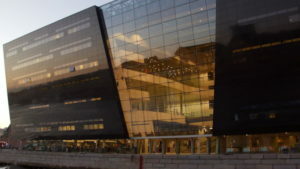 The library was built in 1906, Black Diamond library was its extension that was completed in 1999 works 24/7! If a gorgeous view of the environment comforts you, then the Black Diamond is the place to go to. With a view of the fountain and a space full of light, this neo-modern library has become a timeless educational landmark of Copenhagen. 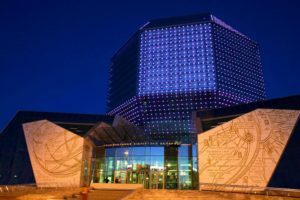 The national library of Minsk is one of the most attractive libraries of the century. It took almost 13 years to get the design approved and about 3000 individuals and 200 enterprises’effort to work this library and in 2006, the National Library was opened. 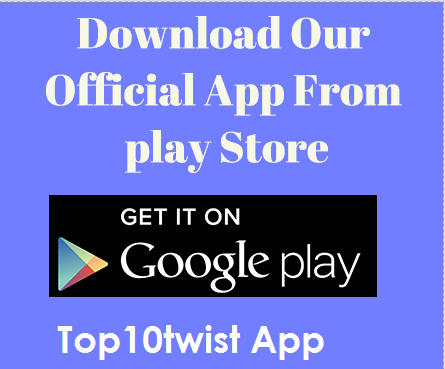 Over 500,000 copies are available for public access. You can take a tour of the library involving the Book Museum along with Minsk at a glimpse with a visit to the Skydeck. The George Peabody Library came into existence on the day of the founding of the Peabody Institute in 1857. The building was designed in 1878 and by architect Edmund G. Lind and Nathan H. Morison, the first Peabody provost. 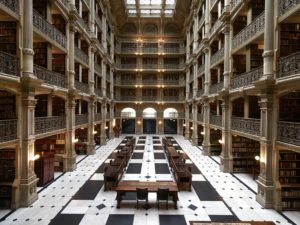 With black and white marble flooring, a 61-foot-tall atrium, and stacks and stacks of books, the George Peabody Library is a dream.